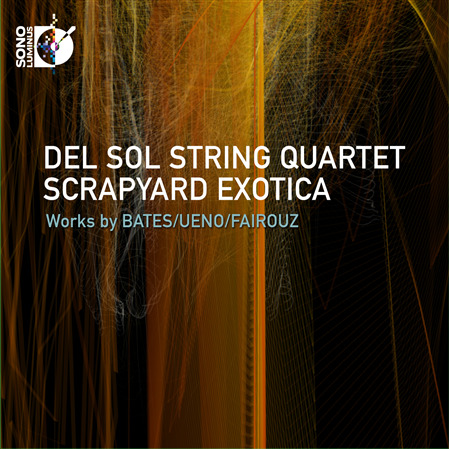 The Del Sol String Quartet releases Scrapyard Exotica, featuring three premiere recordings by a triumvirate of today’s hottest composers. New works by Mason Bates, Ken Ueno, and Mohammed Fairouz, two of which were written specifically for this quartet, comprise Del Sol’s third full-length recording for Sono Luminus, out September 25 as a two disc Blu-Ray Audio/CD combo. Never content to simply re-interpret the existing canon of music for string quartet, the indefatigable Del Sol String Quartet has been commissioning new works and giving eletric performances for over 20 years. The group continues to innovate with Scrapyard Exotica, its third full-length album from Sono Luminus, following 2014’s highly praised Sculthorpe: The Complete String Quartets with Didjeridu. Premiere recordings of new works by Mason Bates, Ken Ueno, and Mohammed Fairouz push the group to their musical and physical limits – and set forth a dazzling and deeply personal vision of what a string quartet can do. The album begins with “Bagatelles for String Quartet and Electronica” by Mason Bates, whose work as a DJ is integral to his compositional approach. A highly collaborative project, Bates began composing the bagatelles by inviting the Del Sols into the recording studio to explore all the unusual sounds they could make with their instruments, then combined cutup samples of these recordings in rhythmically diverse ways to create an electronica part as a fifth voice. He wrote scored parts for the four instrumentalists, who play with the electronica, resulting in a dance-like piece that sounds completely of the moment. Last is Mohammed Fairouz’s evocative and dramatic piece in four movements, “The Named Angels,” referring to the four angels that are recognized by name in the Islamic, Christian, and Jewish traditions: Michael, Israfel, Gabriel, and Azrael. Angels embody justice, power, kindness, healing, death, and other universals; according to Fairouz, “It is natural to express these attributes musically, since music is present in all human communities – it transcends the present and expresses the eternal, never-changing truths of the human condition.”Previously heard only by live audiences who have been captivated by the power of each of these works, the Del Sol String Quartet now makes these recordings accessible to those they have not yet reached in the concert hall. Sono Luminus releases Scrapyard Exotica on September 25, 2015.